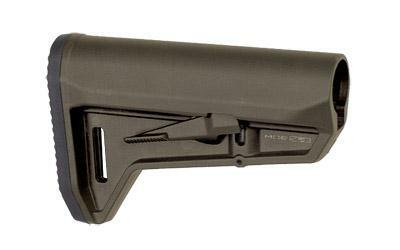 The Magpul MOE SL-K Stock is a compact and lightweight buttsock designed for PDW style weapons or for users who want a small compact stock on their AR-15. The short and slim profile, has dual-side release latches, and a small rubber pad with a rolled toe for easy shouldering and a sure grip. The stock also features a 1.25" footman's sling loop with the ability to add an M-LOK QD Sling Mount for push-button style QD sling swivels. 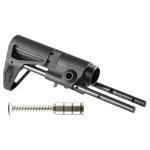 The new ambidextrous release latch minimizes rattle without requiring additional locks for the stock. Sloping cheek weld combines a small slim profile with user comfort. Weight, w/ Rec. Extension: 11.9 oz. LOP, M4 Collapsed: 10.5 in. LOP, M4 Extended: 13.8 in.